There are a lot of people who are looking out for some professionals to tune their pianos. But what if I tell you then you that now you can optimize your piano at home without going out to seek professional help? Yes, you read it right there are piano tuning kits available in the market quickly. The kits usually come with a manual having instructions to follow for tuning your piano. These instructions are easy to follow and hardly take up a lot of time. The piano tuner kit should consist of the necessary tools that are required for tuning your piano. These tools are piano tuning hammer, rubber mutes, temperament mute strip, tuning fork, etc. There are many options of the kits available in the market that have all these tools. 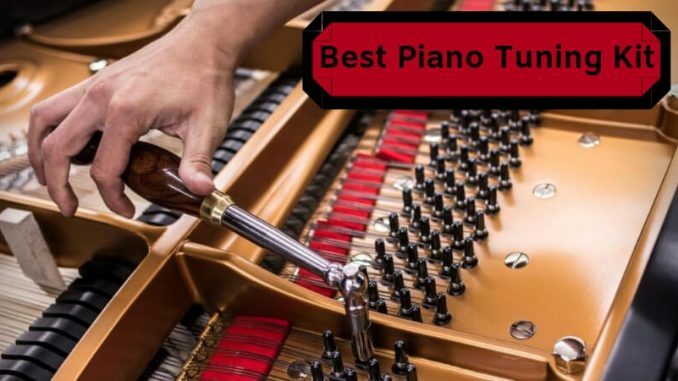 To make it easy for you to decide which piano tuning kit to buy, I have listed the options for the tuning kits that are best in quality and are in affordable range. This kit can be used by professionals, students as well as the beginners. 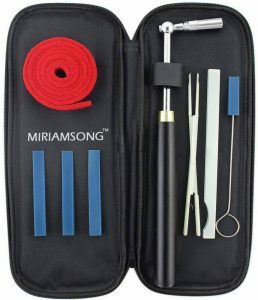 Miriam piano tuning kit is the best seller in the piano tuner kits with the positive reviews by all its customers. 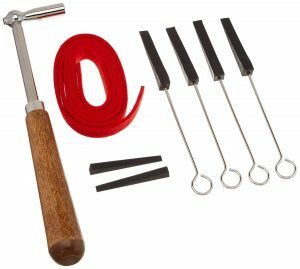 The kit consists of one lever wrench hammer or a key with star head, three rubber wedge mute, one rubber mute, one mute clamp and one temperament strip .the kit is of high quality and in the affordable range. The tools are handy, and the mutes are specifically designed to fit the right sections. The hammer is of high quality, and the is of size #2 that is most commonly used. The kit comes with a case to keep all the tools in one place. Its star-shaped tip is designed to fit several designs and provide flexibility while tuning the piano. It also has a wooden handle to make it comfortable for use. It has a firm handle to maintain the control when you are tuning your piano. The Ecloud piano tuning kit is the piano tuner kit that can be used by the professionals as well as the people who have just started playing piano and are beginners. 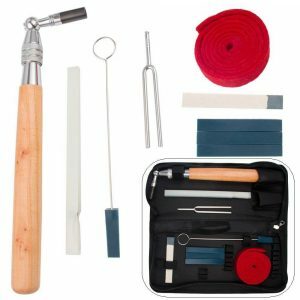 The kit has a one tuning hammer, two mutes with handles, two mutes, one temperament strip along with a bag to keep all the tools in one place. The color of the bag is randomly selected. The kit has an L shape tuning hammer with a star tip which is easy to use or tuning the piano. The kit has all the necessary tools that help you in properly tuning the piano. There are rubber mutes for muting the sections. The handle of the hammer is made up of wooden that is easy to hold and comfortable to use. The temperament strip in the kit can be used to mute off the outside strings so that one string can be tuned at a time. The tools of this piano tuning kit are manufactured in the USA and are of premium quality. 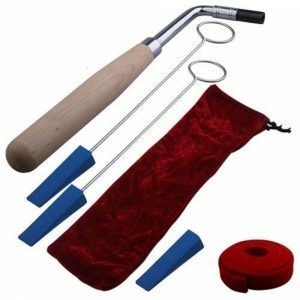 The kit has a professional tuning hammer with a star tip, temperament mute strip, rubber mutes with handles. The star tip is designed such that it fits all the tuning pins with square heads. The piano tuning hammer comes with an interchangeable one-piece head and tip. The kit comes with the instructions to help you in tuning your piano correctly at home. The kit has a professional tuning hammer with a wooden handle. It is an ideal piano tuning kit for students, apprentices or anyone who has started learning piano. The kit is of high quality, rugged and durable. The kit will last longer than regular piano tuning kits. This piano tuning kit has all the required tools for tuning the piano. It consists of rubber wedge mutes, tone tuning fork, temperament strip mute, mute clamp, etc. It has a total of 10 tools in the kit along with a bag to keep all the tools in one place safely. Due to its versatility, it is rated as the customers choice product in the piano tuning kit. The kit has a high-quality mute clamp along with a rubber mute with a handle that works nicely on the right sections. It also has a one felt mute that is specially designed for the left section of the piano. It has a tuning hammer with a star-shaped tip and a wooden handle. The temperament strip should be used to mute all the outside strings of a section at one such that only one string from a section vibrates at once. This piano tuning kit includes one lever wrench hammer, three rubber wedge mutes, one mute clamp a temperament strip. The kit also comes with a case that helps in keeping all the tools together. The hammer has a star-shaped socket fits at several angles for increasing its flexibility. The handle of the hammer is firm and helps in controlling at the time of tuning. This kit has the tools of excellent quality, and it also helps in saving time as well as money in tuning your piano. It has a one quality wool felt mute for the left section which makes it different from all other kits available in the market. There are four mute wedges in the kit for easily muting the strings of the section. The hammer of this kit fits almost all pianos making it easy to use to tune every type of piano. All these tuning kits are available readily in the market. While making this list, I kept a lot of factors in mind such as the tools in the kit, quality of the kit and the price of the kit, the kits are mentioned above have all the tools that are handy to tune the piano. The kits are of premium quality and can be used by students and beginners as well to tune the pianos. I hope this article helps you in finding the best piano tuning kit that fits into your budget and criteria.